World's First 7-Second SFWD Pass - Ramey Built Civic! - Muscle Cars Zone! World’s First 7-Second SFWD Pass – Ramey Built Civic! Making a car that is going to break previous speed record is something that every owner should be proud of, hereby in this video we take a look at the very special Ramey built Civic that looks absolutely amazing, but it is also a record breaking vehicle that is guaranteed to make your blood boil. We check the car out at this year`s event in which import and domestic cars go head to head on the drag track to see which one is the fastest. After going on couple of qualifying rounds and doing pretty well on those, the Ramey built Civic was looking really promising and a serious contestant for the trophy. It went head to head with other serious and powerful cars, but its owner and driver was determined to grab the win. This powerful drive has a pretty powerful 2.0L engine and it is an all wheel drive. But what made this car so special then? 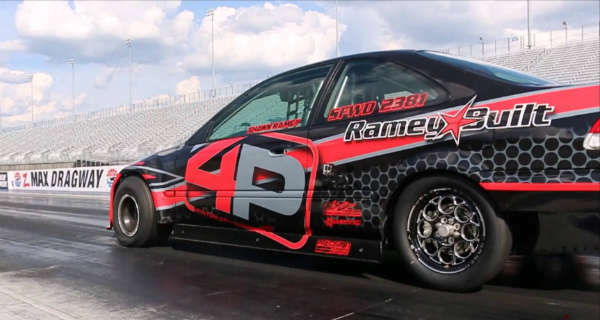 Well, in one of the races, the Ramey built Civic managed to make a run of 7 seconds at whooping speed of over 185 mph, which basically made it the first ever front wheel drive car to do so. It was the fastest pass ever and this Civic can be really proud of what it has managed to achieve. It took some time to finish the car out, but at the end everything went well and we really did enjoy every race in which the Ramey built Civic took part in. What do you think about the car? At last, check out all the poor things Civic drivers have to say!